Townley knows her readers well, and her narrator is a fitting avatar for the poet herself—always ready to encourage others, no matter how timid, to explore and define their place in the world. The moving villanelle “The Closet” expands on the idea of defining the self by circling back to what we find most important in our lives. This concept plays out through the imagined lives of shoes: “The shoes lead here—all shoes show up at night / and call it a day. Each one points back to you. / Step in, step out of town and out of sight.” Our actions reflect and thus define who we are, this poem’s narrator asserts; no matter how secretive those actions may be, they are integral to our formed conception of self. All notions of one’s own being may coalesce secretly at first, in fact: “Step by step you’ve circled back to write / your memoirs in a closet rendezvous,” one that may or may not become wholly public. Like many places throughout Rewriting the Body, these two poems are placed with a keen awareness of space, the field of the page. The poems interact so well not just for their complementary messages, but also because they rest on facing pages near the very center of the book. In a way, the two different-but-equally-vital impulses demonstrated here are key to Townley’s larger message of redefining the self. The title poem comprises this collection’s whole last section and is divided into fourteen poignant parts. Each section of the poem contains powerful abstract actions—methods for doing what this book entreats be done. The body is not wholly ours by default, the unseen narrator points out. We earn it, we cast it aside, we rediscover it and at times even come close to meshing with it wholly. Part 1 likens the body to a powerful, undefinable element: “It arrives and you / take it back / like a hand from the fire.” The body is also a metonym for change, and in part 6 this collection itself plays a role in the body’s definition: “to turn a page / first you gotta / open your fist.” Change in the body can be echoed by change at a deeper level, to which this section attests. In Rewriting the Body, Townley shows that nothing—not even the seemingly immutable self—is set in stone. The changes we seek out and those that find us may be unsettling, but they can ultimately help us settle into more realized versions of ourselves. 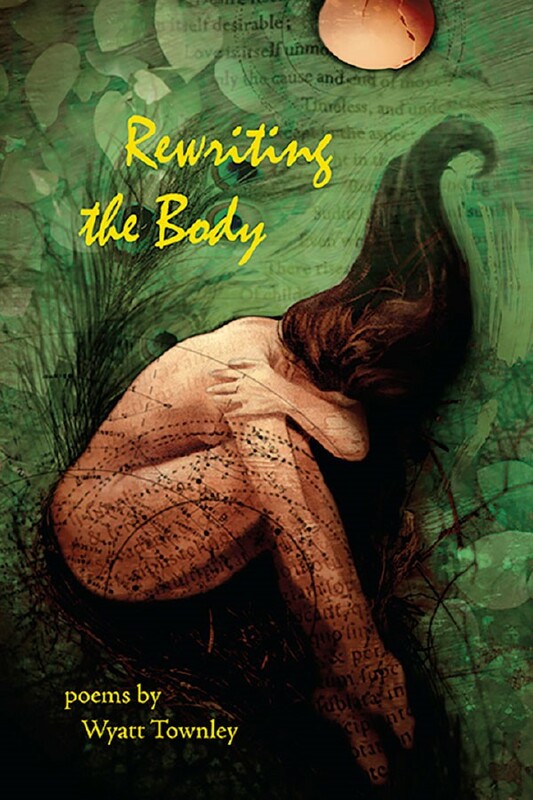 Readers can purchase Rewriting the Body at one of Wyatt Townley’s many readings or from Stephen F. Austin State University Press, as well as online and at regional and national booksellers. Tyler Robert Sheldon’s four books include the poetry collection Driving Together (Meadowlark Books, 2018) and the chapbook Consolation Prize (Finishing Line Press, 2018). He received the 2016 Charles E. Walton Essay Award and is a Pushcart Prize nominee. His poetry, fiction, and reviews have appeared in The Los Angeles Review, The Midwest Quarterly, Pleiades, The Dead Mule School of Southern Literature, and other venues. Currently an MFA candidate at McNeese State University, he lives in Baton Rouge. View his work at TylerRobertSheldon.com.